The Russian conquest of Siberia was an event of which the consequences have only slowly become apparent. Already great, they may come to dominate much of our world; with today’s technology, a resource base of this size and richness confers immense power on the owner. The conquest was a gradual process of absorption. But if one had to assign a time and place for its start, then one would certainly choose the campaign of Yermak in the 1580’s. This enterprise was by no means wholly successful, and probably fewer than a thousand Russians participated in it. But it was the first entry in force into Siberia, and Russian historians have long regarded it as crucial. Among English-speakers, the events are not so well known. The object of this book is to provide the reader of English with translations of the most important documents relating to the campaign. There are several narrative accounts, collectively known as the Siberian chronicles: the Stroganov, Yesipov; Remezov and New chronicles. The Remezov chronicle, written about 1700, is illustrated with 154 pen and ink drawings. These are of great historical and artistic interest, for very few Russian drawings of this period survive. All are reproduced here. The collection of documents is rounded out with seven charters or decrees of Ivan IV relating to the advance across the Urals. 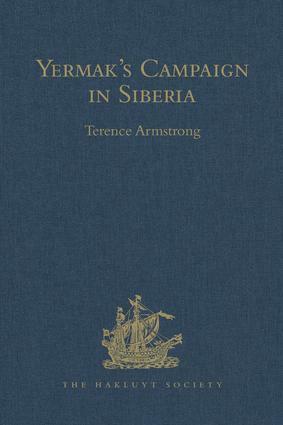 Dr Armstrong's introduction provides background on Muscovy's eastern frontier in the 16th century; the Stroganov family; the Cossacks, in particular Yermak Timofeyevich and his band; routes across the Urals; non-Russian peoples encountered; and the authorship and provenance of the chronicles. Mr William Harrison contributes an essay on Yermak as folk-hero. The frontispiece and map 1 are now printed at the end of the volume. Routledge is pleased to be the publisher for the Hakluyt Society. The Hakluyt Society has for its object the advancement of knowledge and education, particularly in relation to the understanding of world history. The society publishes scholarly editions of primary sources on the 'Voyages and Travels' undertaken by individuals from many parts of the globe. These address the geography, ethnology and natural history of the regions visited, covering all continents and every period over the last two thousand years. Such texts, many previously available only in manuscript or in unedited publications in languages other than English, are the essential records of the stages of inter-continental and inter-cultural encounter. Established in 1846, the Society has to date published over 350 volumes. All editions are in English. Although a substantial number of the Society's past editions relate to British ventures, with documentary sources in English, the majority concern non-British enterprises and are based on texts in languages other than English. Material originally written in Spanish, Portuguese, Italian, French or Dutch has regularly appeared, material in Russian, Greek, Latin, Ethiopic, Chinese, Persian or Arabic occasionally. All editions contain an introduction and scholarly annotation, giving both the general reader and the student a degree of assistance in understanding the material and providing guidance on the relevance of the episodes described, within the context of global development and world history. Volumes are often generously furnished with maps and contemporary illustrations.